Why Choose WordPress over other CMS options? There is no legit reason in the world why you should not use WordPress if you are into website development. WordPress is the real powerhouse of at least 28% of the total websites being run on internet today. That also includes Fortune 500 companies which trust WordPress as their best bet. 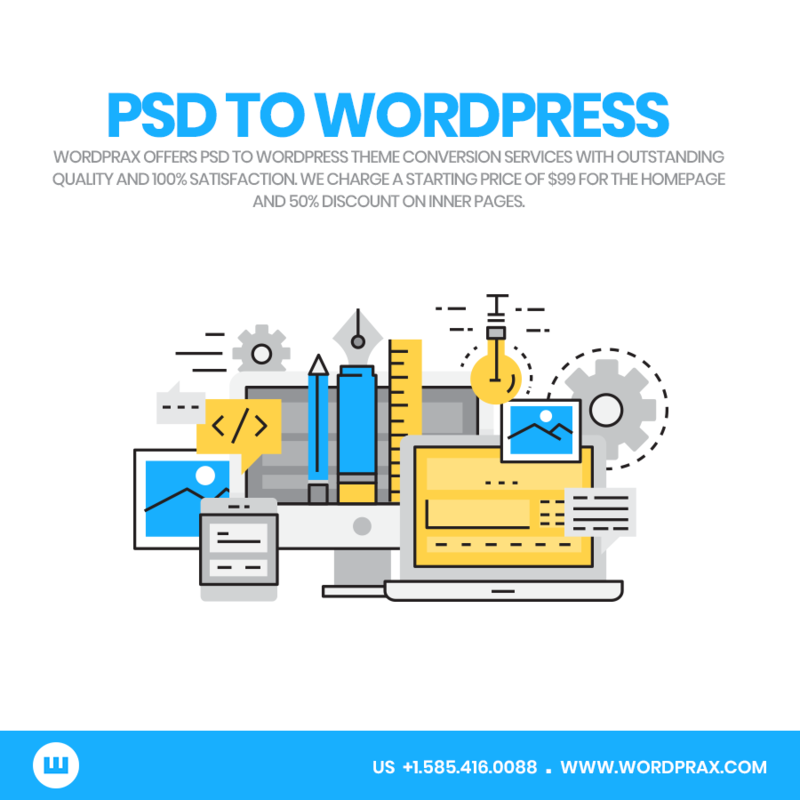 Why choose PSD to WordPress Theme services for your website? WordPress- A CMS which is at least 14 years old and has been constantly thriving and flourishing. It all began when WordPress came as a holy grail for the bloggers to put up their blogs and share with their audience. Gradually, it went on to become the favorite of the web developers and designers across the world and got popular like wildfire. Well, we have reasons for everything! The team behind this giant and number one CMS - WordPress is a bunch of people who selflessly and constantly update WordPress features and functionalities so that it can become more advanced and up-to-date. That is why it should be your first preference and hire the PSD to WordPress service providers to get your website. Well, let us tell you the best part first for some insta motivation. You need to hire a PSD to WordPress service provider because you can easily access your website and edit it even through your mobile browser. If you have internet connection right away, just make changes or update your website right away on the go without having to look out for a desktop pc or laptop! It simply means your website updates are not limited by any operating system or workplaces, if your mind can strike an idea anytime and everywhere, WordPress gives you the freedom to apply that ideas within the comfort of your palm and in a few finger taps. That’s the power of this CMS and WordPress users are quite proud of it. Once a WordPress user, always a WordPress user…goes in sync with this feature of WordPress. When you choose WordPress as your CMS, you get the freedom to create websites as you like them. PSD files when converted to WordPress, not only leads to beautiful and stunning website but also dynamic and easy to customize in any way the client likes. It’s very easy to use and the options to create tailor-made websites are in plenty. Whatever the niche of the website is, whatever kind and type of website the client or you want to make, you don’t need to be worried at all. Thanks to the advanced feature of WordPress that lets the skilled developers mix code using various programming languages in just one go. If you are looking for that 1 CMS that has the power of being SEO-friendly, then it’s WordPress. Right off the bat, WordPress lets you use SEO features and functionalities when you are publishing content, title etc. Even, the images you post into your WordPress blog are completely SEO-friendly. To even give more footing to the SEO factor of your website, there are some amazing SEO plugins that will even make the things much more better! It’s the flexibility of the WordPress websites that gives the users a freedom to do the things more easily. Along with this, scalability in the WordPress websites gives the PSD to WordPress service provider the freedom of scalability as and when required by the client. As we think that a client can require to scale the website to a higher level any time and it is WordPress which lets the users reach success heights. Category: psd to wordpress, Web Development and tagged Best PSD to Wordpress Service by The WordPrax Editorial.